There is a lot of buzz in the market right now as employers are implementing their plans for the upcoming year. Many employers are looking at ways to keep their costs for medical coverage low, but still meet the requirements of the Patient Protection and Affordable Care Act (PPACA). These plans, often referred to as ”skinny plans,” may only cover preventive services or may cover everything but inpatient or outpatient hospital services. Since these plans will meet the minimum essential coverage requirement, as long as they are employer sponsored plans, they will allow employers to not be penalized under the “A” fine of $2,000 per employee less the first 30. However, the lingering question remains about whether they meet minimum value. The plan that only covers preventive services definitely does not meet minimum value, even based on the calculator released by the Department of Health and Human Services (HHS). It returns a minimum value calculation of less than 12%, far below the required 60%. There seems to be much confusion though, with plans that do not cover inpatient hospitalization services. If you are only basing their value on the HHS minimum value calculator, they barely pass with a 60.6% value, as seen below in Picture 1. However, the Internal Revenue Service (IRS), who is tasked with enforcing the employer fines, has stated in IRS Notice 2012-31 that plans that do not cover the four core categories of coverage “would not satisfy any of the design-based safe harbors.” The four core categories they reference include physician and mid-level practitioner care, hospital and emergency room services, pharmacy benefits, and laboratory and imaging services. 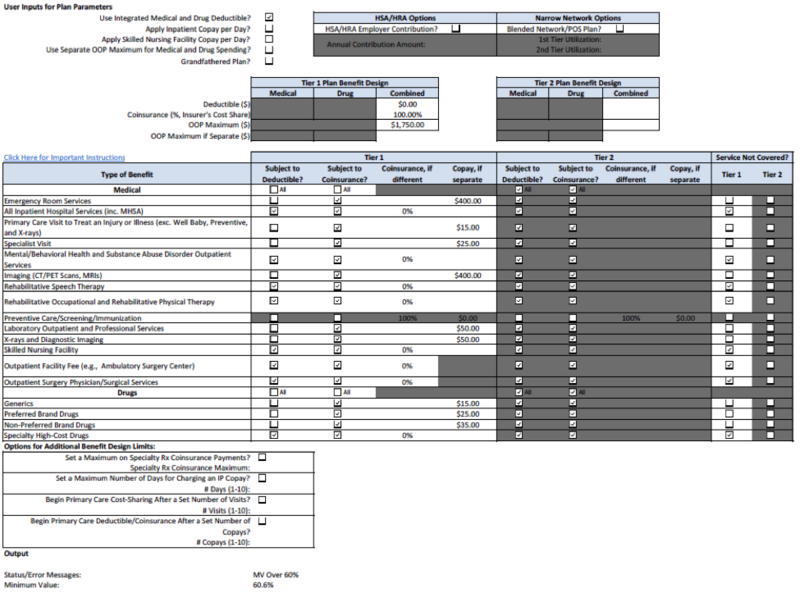 Is it possible that there are technical issues with the HHS minimum value calculator? Quite likely. The first version of the calculator that was released did not calculate properly unless you ran the plan through a second time. Actuaries believe that the skinny plans don’t pass the minimum value test. 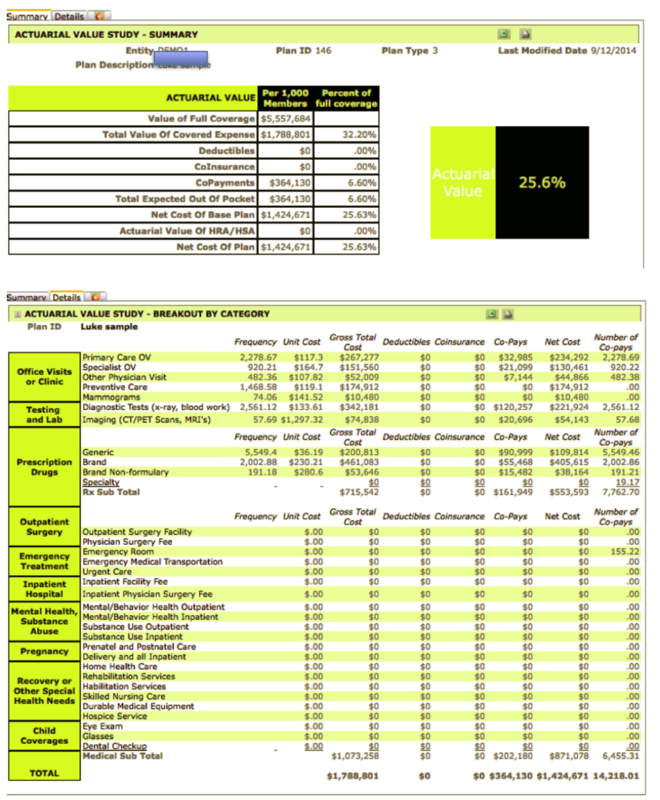 Using ClearPATH, a commercial grade actuarial value calculator developed by actuary Richard Burd, the same plan that passes the HHS calculator, fails the minimum value score with a mere 25.6% value. Pictures 2 and 3 show the details, using the same benefit design as shown in the HHS calculator. 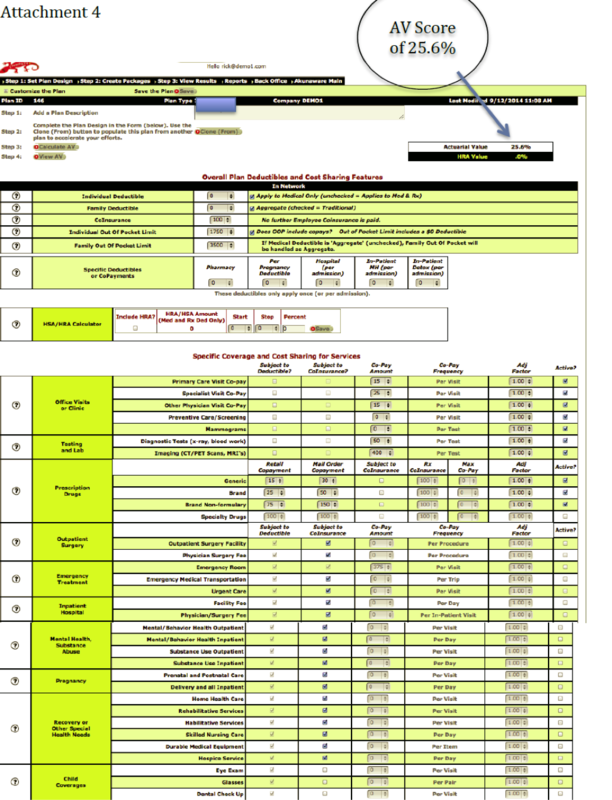 The ClearPATH input screen follows the benefits as outlined in a summary of benefits and coverages (SBC), with total transparency on cost assumptions, and is available from Contribution Health, in Lancaster, PA, or their software partner, Total Compensation Systems. It is interesting to note that other actuary models also place the value of these plans in the same range as ClearPATH. Employers should approach these plans with extreme caution. Since the IRS is the agency that will levy the fines for those employers with more than 50 full-time equivalent employees that do not offer affordable, minimum value coverage, their own regulatory guidance should bear more weight. Employers also should keep in mind they could be opening up potential liability for lawsuits under the Employee Retirement Income Security Act (ERISA). If HHS were to change, or in some views correct, their system, the employees would have made decisions based on not having all the correct information. They would have relied on their employer to supply them with that. If the employer did not perform their due diligence, not only would they be opening the door for potential lawsuits from employees, but IRS fines would also be levied. Unless the IRS also released transitional relief, these changes could occur in the middle of a plan year. With mandatory 60-day advance notice requirements of off-renewal changes, this could prove quite costly for an employer. If faced with making that decision now, employers should always err on the side of caution.